If you have problems downloading, purchasing or installing your speedcam file don't hesitate to contact us to fix them. Remember follow the steps in the installation guide of each GPS device to avoid undesired effects. 1.- Disclaimer about manufacturer requirements for installation procedures. 5.- What are fixed speedcams? 6.- What are mobile speedcams? 9.- Upgrade to yearly subscription. 11.- Can I purchase for different devices with the same account, it means same email? 13.- What happen after I purchase? Dear customer, the installation procedure is defined by your manufacturer. Our work consist of recover the information about speed camera locations and build a file with the manufacturer specifications to work with each GPS device. Trying to make the work of the installation procedure easier for the customer, we've prepared online documentation which can be read in our website. The information, about the installation, is provided to us from your manufacturer. So, it's decision of GPS manufacturer make mandatory the use of a computer to make this installation. We don't sell GPS devices. We only provide speed camera location information. Concerning to our responsability, if you take a look to our website, as soon as you choose your GPS device, to purchase the speedcam database, you can see the installation instructions on the right of web page. So, in this way, we inform you about the procedure you will have to do, and then, you can take the choice to finish the purchase or not. Also, in order to do the things easier for a lot of customers, some email readers has problems showing links very long. Because of that, we've decided to include in the email, an attachment which contains the same information than if you use the link. The goal of our service is to provide a file with updated speedcam information. Information formated and prepared for each GPS device. Trying to make the life easier for the customer, we, also provide to our customers the information that each manufacturer provide us to know how to make the speedcam installation. But, as you can understand, is not part of our warranty, the installation procedure, because it is not defined by us. It is specifed and defined by your manufacturer. In this way we try to do our best to help you to finish your installation, but if you get problems with the working way of your GPS device you should contact to your manufacturer. Our files are not wrong, and that's what we sell. We hope you understand it. Our job consist of to format and prepare the files that your GPS device needs. We convert our speedcam database in the format needed by each gps device. So, our responsability concerns to the files we sent you when you do the purchase. As explained before the installation procedure defined by the gps manufacturer is not our responsability. If you experience issues when the GPS have to read our files, and you get some error, you have to send back to us the error and our technical team will evaluate if the problem concerns to our files or not. If the fault is ours, we'll repack a new file for you to fix the error. If for any reason, after analyze the error, we consider the fault is our file and we can not provide you a new file, then will refund your money. *** It will not be accepted any request of refund related to the contents of our files. If you want to get a look to the contents of our files before to purchase, you can browse our map in the homepage where you will find all the information contained in our database updated to the last moment. Purchase with mobile speedcam, is an option. You will be able to purchase with mobile speedcam when you see that option. If that option does not appear, it means there is no additional data for that specific device, and you will be able to purchase only with fixed speedcam. Most of the installations requires use of a computer, sometimes with SD memory card reader, or USB memory stick, and also, sometimes, is necessary the use of third party softwares provided by the manufacturer, and usually, included in the original CD, of the GPS product. We can not provide that specified software because most of the times they are protected by the law and it is copyrighted by GPS manufacturer. So if you have missed your original software, you have to request it, to your manufacturer, or look for it on internet specific forums. Fixed speedcam are devices, usually hidden from driver eyes, enabled to take a photo when the driver reach more the speed limit of the road. Depending on local law of each country, this devices have to be announced to the driver, or not. So, having a GPS device with speedcam support, will help you to know where they are located. Mobile speedcam are devices, usually hidden from driver eyes, that police changes its location, to make impossible to know where are they. This devices can be located on the road, or they can be inside a police car or a camuflage car. The information about those locations are added to our database depending on the frequency reported in the same place. Remember, your GPS device, is only, able to show static points of interest, so the information about mobile speedcams, even is dynamic information, are static once you upload to your device. Because of that, you should update your speedcam database, at least once per 6 month. Our files contain information about speed camera locations. So, you don't need to use any other special devices, for detecting radar waves or inhibit them. Our files are installed in your own GPS device. Your GPS device reads the imported data and warns you when you're approaching to the speed camera. This way of use is 100% compliant according to the current regulation in all European countries, and rest of the world. According to the new law approved in France, we'll provide to the customer the original speedcam database file with the original speed limit icons. But we'll provide also a set of images that contains only a danger icon instead the speed limit icon. If you want, you will be able to replace with those images the original ones. In that way your GPS will show a danger icon, instead the speed limit icon. This feature of icons replacement, could not be available for some GPS devices. 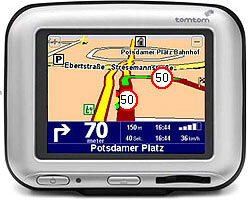 It is because, in many GPS devices, the speed limits are part of the map information. So, in that case, it will be part of manufacturer responsability to update the firmware of the device to make it suitable to the law. Sample of speed limit built-in the own map. Sample of speed limit icon exclusive for speed cameras which can be replaced. If you are a new customer, you have to purchase for the first time in our home page. Once purchased, you will have the choice to upgrade your recent purchase and convert it into a yearly subscription, during the first seven days after your purchase. Once you purchase for the first time, you will receive a login and password, to get access to your customers private area. There you will be able to download your updates, and renew your purchases. One of the most common problem is the memory limit of GPS devices. Our database is continuosly changing. Sometimes grows and sometimes not. Depending on the coverage you decide to purchase, it will has a size or other. And because of that, you could experience any issue trying to import data into your GPS device. If, during the installation process, progress bar stops, or after a complete import, you are not able to see the speed cameras, it means, probably your device can not manage all the information. To fix this you can do login into the customers area, Customers Control Panel, and customize the coverage of your database. You can do this when you purchase a region. For example, Europe, Western Europe, etc. It means a set of countries. Remember, not all devices allow to use the customization tool. If you don't see this feature in your customer area it means it is not available for your device. Yes, since end of may 2013 you will be able to make more than one purchase for different devices, and manage all of them from your customer control panel with the same account. It means using only one email to manage all purchases. In this way you can make the purchase for a friend or any member of your family. 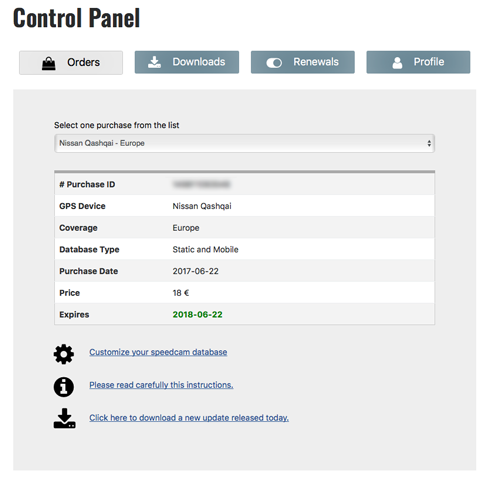 When you get access into your control panel, you will be able to see, in the orders section, a new dropdown list where you can select the purchase you want to manage each time. At the top right of this page you will see an image like this one: . Click in the image, and you will be redirected to the customers login page. The login user is your own email, used in your purchase. After you confirm your purchase, you will receive a new email with the random password generated by our system. That's the password you will have to use for the first time. Once logged in you can change the password if you want. If you loose the email which contains the password or you don't remember it, you can request for a new one at the bottom of the customers login page. Just after you purchase you will have to receive two emails. First one you will receive, contains a link to your download. Usually the file that you need is already attached in the email, so you don't need to use the download link. So you can use the file attached in the email. You can also find a direct link to the installation instructions. Also some links to the help and others. The second email you will receive, contains the credentials needed to get access to the customers login page. If for any reason you didn't receive the emails, maybe they could be located in your spam folders. If not, go to the customers login page. Ask for a new password, using the same email you used to do the purchase as your login. When you receive by email the new password then you will be able to get access to the customers page.